The beginner explores the fundamentals of playing guitar, including an introduction to the basic chords, scales and reading music. Students analyze and critique their sound and performances regularly. Daily practiced routines focus on physical technique and sight reading while developing an understanding of music theory. Intermediate guitarists work toward a stronger sense of reading, composing and performing with an emphasis on ensemble practice and performance. Students expand their knowledge base in theory, notation, and practice techniques in a variety of styles. Advanced students expand their knowledge base in theory, notation and practice techniques in a variety of musical styles. College bound music students are supported in their prparation for scholarship and acceptance auditions for universities and conservatories. Beginning piano is designed for students who have little to no prior experience on piano. This course will build solid foundations for beginning musicians in: basic keyboarding skills, reading music, beginning music theory and overall musicianship. Intermediate pianists with prior experience in basic keyboarding and the ability to read standard music notation further their understanding of keyboarding technique, piano repertoire, composition, arrangements, and overall musicianship. Advanced students expand their knowledge base in theory, notation and practice techniques in a variety of musical styles. College bound music students are supported in their preparation for scholarship and acceptance auditions for universities and conservatories. Our jazz band is a musical ensemble that plays jazz music. According to the Smithsonian, “jazz is a kind of music in which improvisation is typically an important part. In most jazz performances, players play solos which they make up on the spot, which requires considerable skill. There is tremendous variety in jazz, but most jazz is very rhythmic, has a forward momentum called “swing,” and uses “bent” or “blue” notes. You can often hear “call–and–response” patterns in jazz, in which one instrument, voice, or part of the band answers another.” Jazz bands and their composition have changed many times throughout the years just as the music itself changes with each performers personal interpretation and improvisation which is one of the greatest appeals of going to see a jazz band. Jazz bands vary in the quantity of its members and the style of jazz that they play but our jazz band is primarily performs as a big band, which is made up of a rhythm section and a horn section. 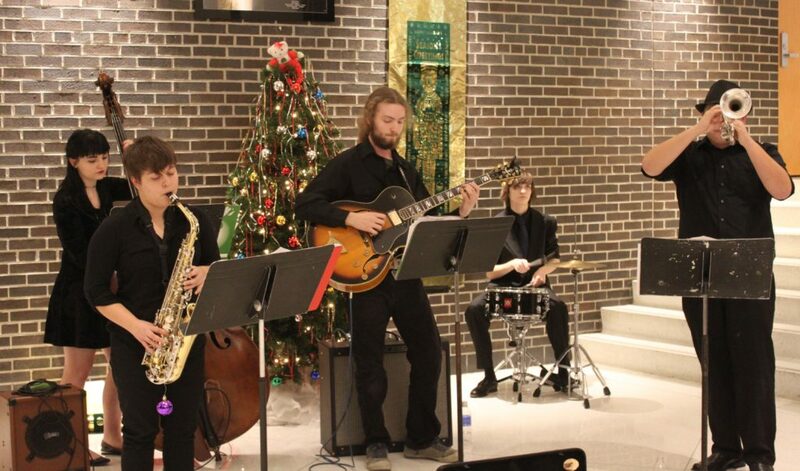 Our musicians are encouraged to explore various styles of jazz and often explore and perform as a member of smaller jazz combos in addition to the big band. Special emphasis will be placed on scales, chords, blues progressions and other music theory as related to composition and improvisation. The large band focuses on developing improvisation skills and ensemble playing. MATERIALS REQUIREMENT: It is required that you provide your own brass or woodwind instrument for this course. A concert band, also called wind ensemble, symphonic band, wind symphony, wind orchestra, wind band, symphonic winds, symphony band, or symphonic wind ensemble, is a performing ensemble consisting of members of the woodwind, brass, and percussion families of instruments, along with the double bass or bass guitar. Occasionally, our concert band may include additional non traditional instruments, such as piano, harp, synthesizer, or electric guitar. Our concert band’s repertoire includes original wind compositions, transcriptions/arrangements of orchestral compositions, light music, and popular tunes. This course is open to students who read music and perform on a concert band instrument (piccolo, flute, clarinet, double reed, saxophone, trumpet, French horn, trombone, euphonium, baritone, tuba, string bass or percussion).